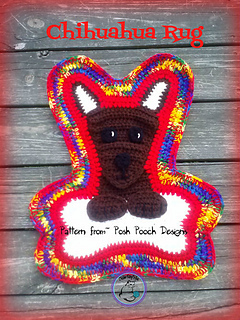 It is the perfect size for your Chihuahua or for a super cute Wall hanging. The Crochet pattern is not easy, but not difficult either. And the Rug will need some Blocking if you are a tight crocheter. Crochet pattern is a Step by step photo tutorial, and is worked with 2 strands of Worsted weight yarn and a J hook. Please do not copy and/or redistribute this pattern. You may make and sell items if you desire.